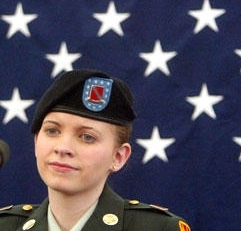 Jessica Lynch, who unwittingly became the best-known Army private of the Iraq War, has added her support to the Obama administration’s plan to end restrictions on women in Army combat units. Given what she went through in Iraq, you’d be excused for thinking Lynch would have other views about women at the front. Her authorized biography, written by Rick Bragg and published in November 2003, presents a disturbing account of her lone exposure to combat. That came by mistake in southern Iraq on March 23, 2003, when elements of her support unit, the 507th Maintenance Company, made a wrong turn and plunged into Nasiriyah, a city under Iraqi control. The heavy vehicles and Humvees of the 507th came under withering fire. Lynch was in the backseat of a Humvee, driven by her friend Lori Piestewa; they were trying to escape the Iraqi assault. “‘I just wanted it to be over,’ Jessi said. It had been about an hour since the battle began in the city of Nasiriyah, maybe a little longer. “In fear and resignation, she could not look at it anymore. “Just ahead of them, Iraqi soldiers had used a truck to block the road. An American tractor-trailer rumbling just in front of Jessi and Lori’s Humvee came under heavy fire, and, swerving to miss the Iraqi truck, ran off the road just in front of them. “In the mass of Iraqi fighters, one of them raised a rocket-propelled grenade launcher to his shoulder and sighted the speeding Humvee. He squeezed the trigger. “Jessi, crouched in the back seat, her arms around her own shoulders, her forehead on her knees, did not feel the round that finally punctured Lori’s control and sent the Humvee bouncing off the road, straight at the five-ton tractor-trailer. “The last thing she remembered was praying. “‘Oh God, get us out of here. Lori Piestewa died of her wounds. Three other soldiers in the Humvee were killed in the crash or died shortly afterward. Lynch, who was 19, suffered shattering injuries to her spine, right arm, right foot, and left leg below the knee. Lynch lingered near death at the Iraqi hospital before being rescued by U.S. special forces on April 1, 2003. Two days later, the Washington Post published an electrifying but thoroughly botched front-page account that said Lynch had fought heroically at Nasiriyah and that despite being shot and stabbed, she fired at attacking Iraqis until she ran out of ammunition and was captured. In fact, Lynch suffered neither gunshot nor stab wounds. She never fired a shot at Nasiriyah: Her weapon had jammed. The story was picked up by news organizations around the world and made Lynch — who never embraced the story — a household name in America. The hero-warrior tale almost surely was a case of mistaken identify: The exploits the Post erroneously attributed to Lynch most likely were the deeds of Donald R. Walters, an unsung cook-sergeant in Lynch’s unit. Walters was one of 11 U.S. soldiers killed in the battle of Nasiriyah.